`Vinaya Vidheya Rama` is an Outdated, Over The Top Action-tainer. Story : Ram (Ram Charan) is an orphan and gets raised by 4 Brothers (Also Orphans) who in turn settle as responsible Government servants. He is a Super Human who keeps fighting the baddies and saves his family time and again. But a powerful nemesis, Raja Bhai strikes a big blow to Ram`s family. The rest is about payback. 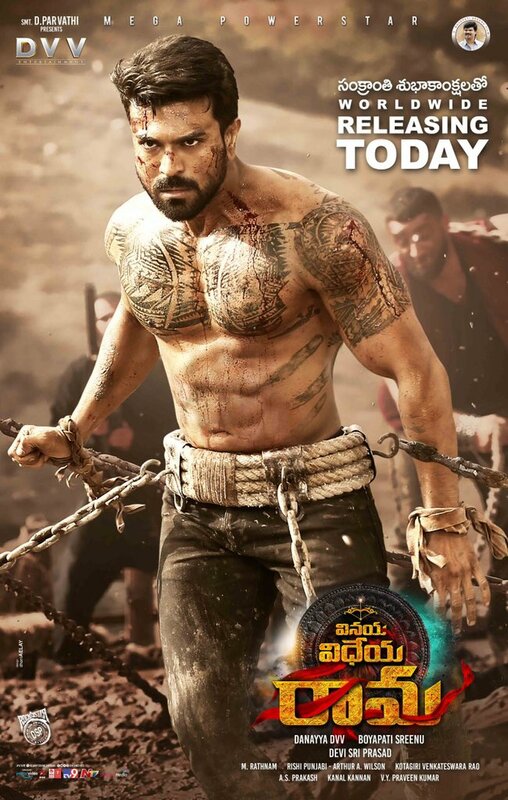 Ram Charan in a Super Human character tried his best but couldn`t over come the limits of bad writing. Only Vivek Oberoi and Prashanth got important roles and they are adequate. Ram Charan after a Huge Blockbuster in `Rangasthalam` is back to basics to appease his fans. Although his intentions are good, Director Boyapati`s execution will leave him embarrassed. VVR is an outright Action Feast right from the word go and all these lavish Fight Sequences might have helped if the story is meaningful and the narration is convincing. Instead, Boyapati took things for granted and made a film with full of action episodes, leaving the film soulless. Only bright spot about `VVR` is it`s rich Production values. Box-office Verdict : May turn out to be a Disaster irrespective of Festive Season.